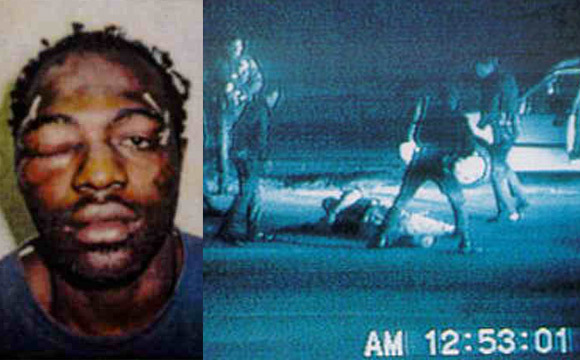 On 3 March 1991 Rodney King, a black building site labourer, was speeding on his way home when four Los Angeles policemen — Laurence Powell, Timothy Wind, Theodore Briseno and Sergeant Stacey Koon — stopped him. They then administered a severe beating to King. The policemen later claimed that they believed that King was under the influence of phencyclidine (PCP). Later tests showed that his system was clear. New charges were filed against the police and at a new trial Officer Powell and Sergeant Stacey Koon were found guilty while Timothy Wind and Theodore Briseno were acquitted of all charges. Powell and Koon were sentenced to 30 months in prison. King was awarded $3.8 million in a civil case. In May 1991 he was arrested on suspicion of trying to run over a policeman who had discovered him with a Hollywood transvestite prostitute. Two years later, he was admitted to rehabilitation for alcoholism. In July 1995 he was convicted of a hit-and-run assault on his wife and jailed for 90 days. On 27 August 2003 he was again arrested for speeding and crashed his car into a house, breaking his pelvis.